Being one of the most diverse countries we’ve ever been to, the famous city in Indonesia has a little bit of everything for everyone. The iconic Bali tourist attractions are famous all around the world. From serene temples and volcanoes to the jungle wildlife in Sumatra. It offers diverse nature, culture, and cuisine. Indonesia is a country that is largely underrated. While the sandy beaches of Bali are very popular, there is so much more to this incredible country that remains unexplored and unpublicized. Indonesia is home to some of the world’s most beautiful picturesque travel destinations in the world. It is impossible to explore all of them in a short period of time. 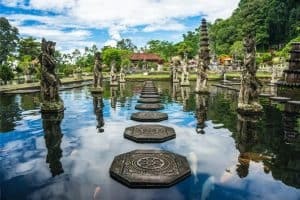 Whether you are traveling across Indonesia or just a city or two, you will be able to take something away from these great tips for going to Indonesia. There are many reasons to visit Indonesia. It has many famous places to visit, amazing cultural heritage and amazing natural resources. The Indonesian population is religiously diverse. The five religion in Indonesia has many religious and cultural rules and traditions. There are many reliable means transportations to get around Indonesia. Blue Bird taxis. it is the safest and most recommended taxi company in Indonesia. You will pay according to the meter so there’s no need to worry about being ripped off. This taxi also has an app that makes ordering and paying easier. The best way to travel around Indonesia is to browse their apps first. Online rides. Besides the taxi services, you can also try Indonesian online rides for motorbikes to cars. Among the most trustworthy services is Gojek, Grab and Taxi. Although in some airport this service may not be available due to position dispute with taxis but outsides airports you can safely order. Traditional transportation. Indonesia has some traditional means of transportation that are cheap and fun. Try to ride them and have a great time. Drive on the left. you can rent a motorbike and explore the city. it is better if you have an International driving license. If you do decide to roam the street by yourself. Prepare to drive on the left side of the road and pay attention to the street signs. There are many little things that turn out to be a lifesaver on the go. Sachets. There are many small stall or warungs that sell small sachets of everything from deodorant, shampoo, sunblock, detergent to coffee. It is a quick and convenient solution for traveling in Backpacking in Indonesia, particularly in more isolated areas. Cheap laundry. You can just trust the cheap laundry services available in Indonesia. They weight your laundry and charge cheaply. ! a kilo of the load will cost only 8000 rupiahs. Jeans repair. There are many jeans services that you can wait for an hour or two. So you can travel nicely. Indonesia archipelago is at the center of the earth, which is basically have very hot temperatures. Pay attention to travel around the country and ready for the heat. Bottled of water. Indonesia is not a common country for tap water. Make sure to stock up on bottled water while traveling around the country. The best way is to purchase a large 2+ gallon jug of water and refill reusable bottle throughout the trip. Mosquito Repellant. Tropical countries are famous for their mosquitos. Always have a reliable brand of mosquitos repellent to stay away from those itchy bites. Modest clothing. Due to the heat, you are probably are comfortable with shorts and a T-Shirt. Keep in mind Indonesia is very religious. It is better to dress modest and unrevealing. There are light clothes that absorb the heat well. Indonesia has an adequate service in the overall part of the country. Some more secluded areas will tend to be more difficult. Local SIM Cards. Indonesia SIM Card is quite reliable, such as Telkomsel SIM card, dont buy them in the airport because it can triple the actual price. There are mny street vendors that sell local SIM Cards. You can spend about 100.000 for it. Free Wifi. Public places have free wifi with a minimum speed. More and more people come and work in Bali, so the island has some of the best wifi services. Big cities such as Jakarta, Bandung, and Surabaya also serves a great wifi. Travel adaptor. Indonesia uses the ‘C’ type of adaptor or European-style two-pin round plugs. If this is too much confusing you can use your laptop charger or save up the battery by putting them in Airplane mode. Indonesia is a very welcoming country to tourist and has a lenient regulation about immigration. Get to know the type of visa available in Indonesia. There are more than 169 countries are eligible for a free tourist visa valid for thirty days. Indonesia also offers a visa-on-arrival for citizens of 61 countries. A tourist from United States, India, Japan, Malaysia can travel conveniently here. There also a working visa if you are interested in working in Indonesia. Appropriate Visa. It is very beneficial to move to Indonesia and working there. The life of an expat in Indonesia really has many advantages. Make sure you come with the proper document, visa, and legal law support. Scan Documents. Passport, ID and holiday itinerary is better to be scanned and then email it to yourself. This way you have another digital backup documentation in case you lose them. Squat Toilet, if you are not a fan of these things. Malls usually have sitting toilets. Bring your own tissue since most Indonesian prefers washing up with waters. Sanitary soap for more hygienic it is better to travel around Indonesia with extra soap because most toilets don’t provide them. Coins. because Indonesia has many of them. a glass of water only cost about 500 rupiah and many street snacks start at 1000 rupiah. Two wallets. One for a small amount of money and another for a best-kept emergency fund. Money Changer. ATMs is a reliable money changer as they offer more competitive fees and charges. Remember to use reputable ATMs to do this. Tipping. for parking, the average tips are 2000 to 5000. Other services vary from 10,000 or 20,000 rupiah tip should be enough and may be higher priced services. The tip is the same as 15 percent in America. Some Bali most restaurants include a service charge on the bill. For spa treatments, offering tips to the masseuse or treatment provider is definitely very polite. Countries in Southeast Asia often portray as a party paradise with tropical atmosphere, colorful and taste dishes and heaven for addictive drugs. Indonesia is NOT like other SE Asian countries in terms of illegal drugs usage. Their strict law can result sentenced to severe punishment with drugs possessions and even the death penalty. Download an offline map of Indonesia to the area where you ‘ll be exploring. Google Maps and Maps.me are two great applications that let you do this in Indonesia. It’s very helpful to have this information at your fingertips when WiFi is not available. If you are going to Bali, save the map to that islands. This also applies to major cities such as Jakarta and Jogjakarta. There you have it some crucial things that you need to pay attention while traveling in Indonesia. Anyone can enjoy sightseeing the country no matter what your traveling style. There are affordable places in Indonesia for backpacker, great for couples and very recommended for families.